Troutrageous! Fly Fishing & Tenkara Blog: SkyMall Tenkara? Was flying to Philly from Jacksonville yesterday and picked up the copy of SkyMall in the back of the seat in front of me to pass a bit of the time. After paging past indoor doggie pottys and zombie lawn ornaments, I noticed a telescopic fishing rod for sale for $30. 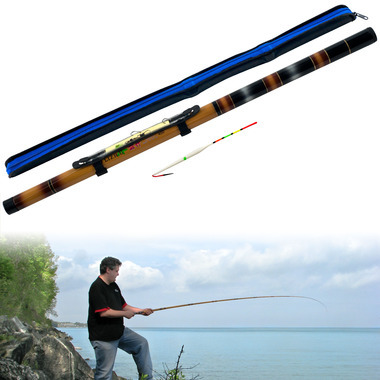 Take this incredible Telescoping Fishing Pole anywhere! This amazing fishing pole collapses to an incredible 24.25 inches and extends to an astounding 171.5 inches! Just FYI - I've seen a ton of these plastic tenkara rods on Amazon over the last couple weeks.